STAYnEAT, The Helping Plate is so innovative, it’s patented with unmatched features & benefits. 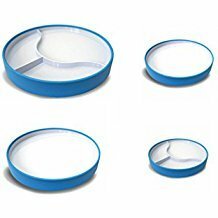 Unlike traditional plates, it has a vertical rim that’s non-skid making it slip-, tip-, and flip-resistant while doubling as a spill guard minimizing mealtime messes. The slightly sloped surface & side scoop wall easily helps put food onto utensils while preventing soggy meals. It’s Reversible two-in-one design with and without a section divider is brilliant. Simply depress the center of the plate to make it stay, lift it’s edge to take it away. The harder you press, the stronger it suctions to all non-porous, rigid, flat surfaces. Designed for self feeding and less cleaning, makes it perfect for all children, adults & special needs. Dishwasher-safe (top shelf) & Made in USA with with Tritan (BPA-, BPS-, PVC-, lead & phthalate-free). Makes a truly novel gift. Includes 1) Small 1.25”h x 7.5”w and (1) Large 1.38”h x 9.5”w Reversible Plate Set. Available in various colors and also sold separately. If you have any questions about this product by STAYWARE, contact us by completing and submitting the form below. If you are looking for a specif part number, please include it with your message.